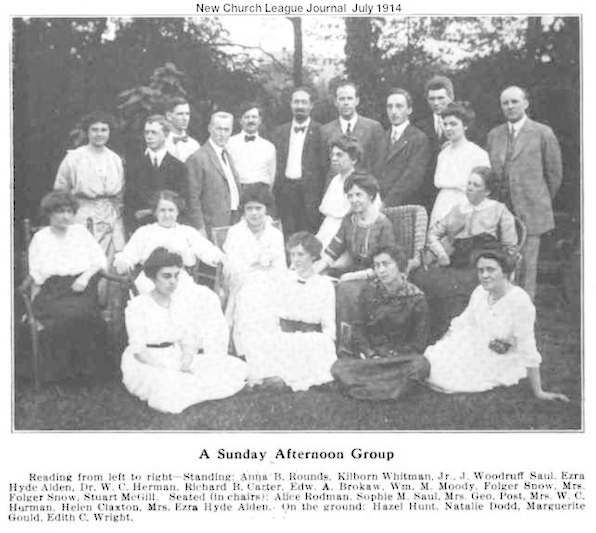 Helen Claxton, at age 39 or 40, is seated in the middle row, in the wicker chair 2nd from the right, in this 1914 New Church League Journal photo. Helen Catherine Claxton was born in Neston, Cheshire, England, about 15 miles south of Liverpool, on April 14, 1874 to William Richards Claxton & Mary Ann Claxton, and was baptised in Neston on May 15, 1874. Although it is yet unknown exactly where she lived as a child and as a young adult, nor when she and/or her family moved from England, we do know the following: She lived in Montreal from 1907-1912; back in England in 1913 in Birkenhead (directly across the River Mersey from Liverpool) where she had relatives; in New York City 1914-17; and then in London in 1918-1921. She is recorded as having lived in Montreal again for much of 1921-1930; however, there is no known record of where she lived from October 1922 through July 1925; although she was reported in October of 1930 to have "resided in Paris for several years." The year 1931 finds her back in New York City before moving to Uncasville CT in 1932. And finally, in 1933 she moved to Cambridge MA where she remained for the rest of her life. She was a nurse by profession, graduating from the Presbyterian Hospital Training School (now the Columbia University School of Nursing) in New York City in 1899 when she was 25 years old. She had an article published in the October 1909 the American Journal of Nursing titled "A Plea for the Profession of Private Nursing" in which she urged the regulation of hours on duty of private nurses to a maximum of an 8-hour day. At some point in her career, she also got a nursing degree from the School for Medical Gymnastics in Stockholm, Sweden. When she was 41, she enlisted in the Canadian Army Medical Corps in February of 1916, serving as a military nurse in Europe during WWI. Her military record indicates that she had had previous military experience at Dr. de Page's Military Hospital in Belgium, and that she was 5'6" tall. 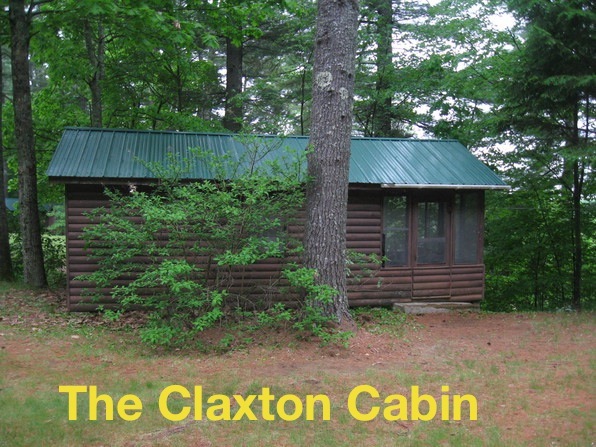 Helen Claxton was active in the Church throughout most of her adult life. Confirmed church activity includes: in the Youth League as a young adult, briefly at the New York New Church when she lived there in 1931, and at the Cambridge New Church (now the Swedenborg Chapel) beginning in 1933 for the rest of her life. Here she lived within easy walking distance of the church most of the time, and served for many years as the superintendent of the Sunday School. She was a member of the church's Half Hour Club, a women's social group that met in various members' homes. At the Half Hour Club meeting an April 1936, "a birthday cake with lighted candles was presented to Miss Helen Claxton, a member who was celebrating her birthday." She was active at the FNCA as well. 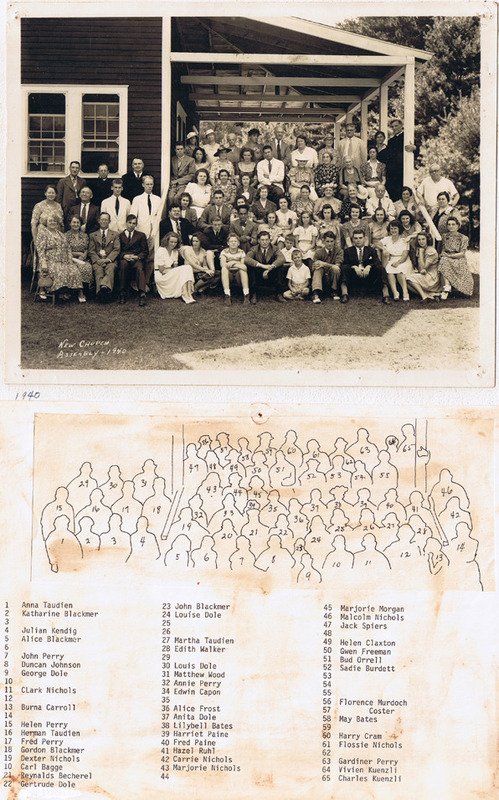 Although we don't know when she started or stopped attending the FNCA, she is in the All-Camp Group Photo in 1940 (the year her cabin was built!). © F.W. Fergie 1940She's #49, seated second row from the back, 3rd person from the left, in the light print dress and dark colored, fancy hat. On October 31, 1942, when she was 68 years old, after having been a spinster all her life, she married Leon C. Le Van (1900-1988), who was ordained as as a New Church Minister in 1945 serving Convention churches in Providence (3 years), Pittsburgh (18 years), and St. Petersburg (16 years). Just 3 years after their marriage and 1 year after Leon's ordination, Helen Claxton died one month shy of her 72nd birthday in Cambridge MA on April 14, 1946. Stephen E. Novak, Head, Archives & Special Collections, Augustus C. Long Health Sciences Library, Columbia University Irving Medical Center, New York City NY for the bulk of the information which appears on this page. Thanks also to Amanda DeAngelo, Principal Clerk, Cambridge City Clerk's Office, Cambridge MA.